Jackson Cove (Chris Klein of the American Pie series) is an American WWI fighter pilot stationed in Egypt. Though he has been grounded due to his alcoholism, he’s soon reactivated and dispatched – via truck – to find a downed, traitorous German ace pilot (Josef Von Zimmermann, played by Werner Daehn) believed to have been smuggling valuable intel about the Central Powers, which the Allies want. Accompanying Cove is Eleanor Morgan, a German-speaking British nurse charged with tending to Von Zimmermann’s injuries and keeping him alive long enough to retrieve the information he has. However, myriad obstacles – including sandstorms, Von Zimmermann’s inconsistent amnesia and permanently ingrained hostility, Cove’s own disinterest in saving the combatant who killed his brother, and a host of deceptions complicate the otherwise straightforward mission. Damien Lay’s film opens with great promise. Picture Von Zimmermann sitting beside the wreckage of his plane, trying to convince himself “There is no pain” as he pulls an 18-inch long shard of metal out from his leg. It’s gritty; it’s intimate. It’s a perfect opening. And then, Lay employs the most ill-fitting, crimson hued credit sequence belonging more to a Western, complete with Bonanza-like music, and all pre-established tone and theme are immediately lost. These opening minutes are a perfect analogy for the film as a whole. Sometimes, the pieces come together impressively. At other times, however, they crumble with almost equal awe. To date, his credits as writer and/or director are all documentaries, so ostensibly this is the filmmaker’s first major foray into narrative – and it shows. Lay’s script roller coasters between serious, flippant, formulaic, contrived, and dull. Cove might be an interesting character, were he not so stereotypically gruff, damaged, and nonchalant. As an antagonist, Von Zimmermann too has potential. He has just betrayed his country (why, we’re not ever really sure), and both sides are after him. However, due to his plane crash, he doesn’t remember any of this. Yet, he remembers killing 27 Allied pilots and is driven by that entrenched bloodlust. He, Cove, and to a lesser degree Morgan, all become quasi-parodies of the characters they are supposed to be, and as the dialogue worsens, interest in the film evaporates. 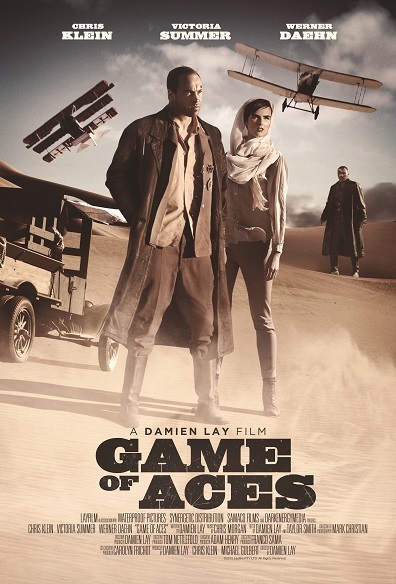 Game of Aces scores marks for its cinematography and aptitude for capturing the era and Egyptian desert well enough, but the story and its delivery force it into a dead-stick landing.